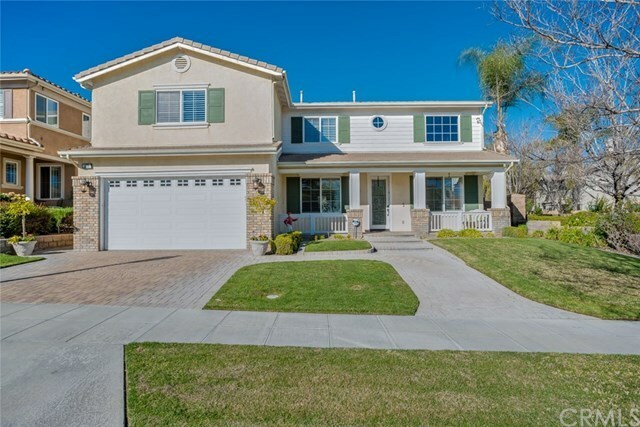 Beautifully upgraded, 3573 sqft Standard Pacific home in the desirable Colonies neighborhood in Upland, with a LOW TAX RATE! This amazing home will impress you right away with a professionally landscaped front yard featuring custom designed walkways, driveway & front porch area, beautiful leaded glass front door. Entering this home you will notice the owners have spared no expense.The foyer greets you with a custom designed floor medallion, the elegant living room has plenty of light from the clerestory windows, the entrance to the dining room is enhanced by beautiful custom molding. You'll love the family room & fantastic gourmet kitchen, the family room fireplace has granite & a custom designed mantle, flanked by sconce lighting, entertainment center, & a bar cabinet w/ beverage cooler.The huge kitchen is highlighted by the sparkling crystal chandelier, great view of the swimming pool & spa, newer white cabinets, glass cabinet panels, large walnut stained island, newer appliances, dbl ovens, microwave, 5 burner cooktop, walk in pantry, butlers pantry between the dining room & kitchen.There is a bedroom downstairs.Upstairs there are 4 bedrooms, movie theater, laundry room.The spacious master suite has 2 closets & upgraded bathroom w/ make-up vanity.The resort like backyard has a pebble pool & spa, baja step, & upgraded Twin Eagles BBQ island.Other features include, upgraded flooring, oversized crown molding, plantation shutters, 4 Car garage.Don't miss seeing this home!